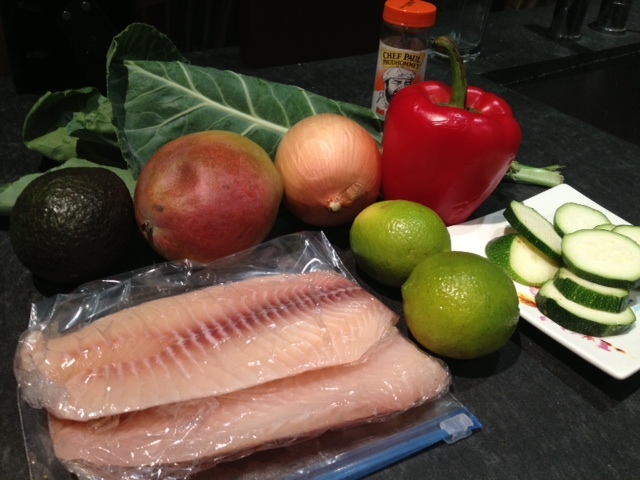 Fish Tacos, Sort Of, But Also Lettuce Wraps | Britt Does Fit. *If you don’t like mangoes, you can use pineapple, or any other fruit you like. Or, if you’re one of those sad boring people, you can use no fruit at all. Here is the those ingredients’ headshot. Resume is on the back. So first things first, rinse your collard greens, because those thangs can be dirty. Let them dry while you’re doing all this other stuff. OK so you want to start by slicing your pepper and onions into strips, and sauteing those for about 5 or six minutes, or until they look like this. Set them aside, and tell them to be patient, they will be needed again in mere minutes. 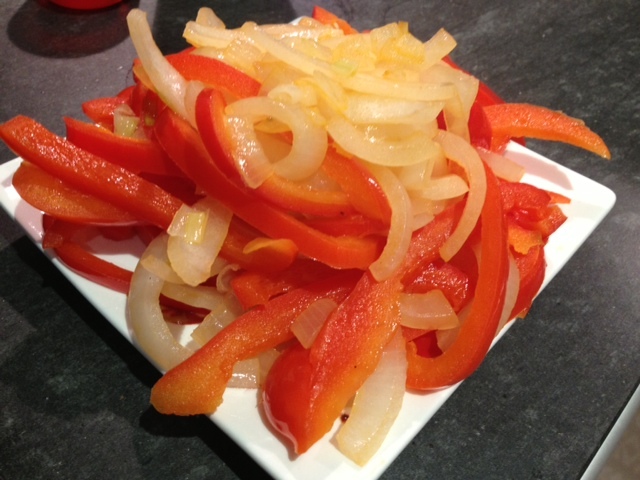 Peppers and onions. That’s it. Now take care ‘o’ dat fish. Spray the pan (same one, no sense in washing a SINGLE thing more than you need to) with some nonstick spray and coat both sides of your tilapia with the seafood seasoning. I usually do seafood magic to start, and sprinkle a little taco seasoning at the end. 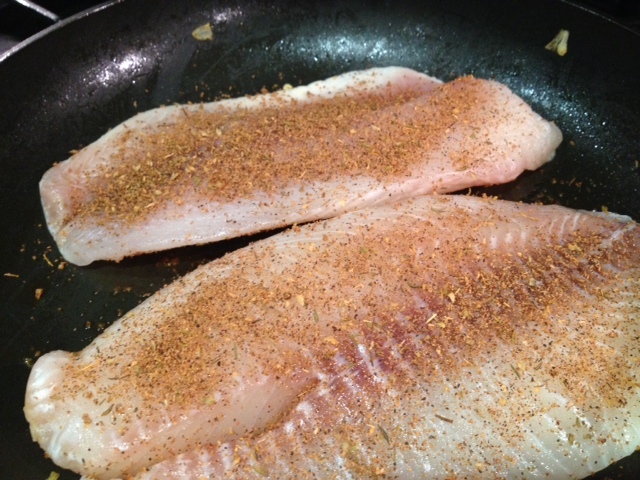 Cook the tilapia on medium heat for about 4 minutes on each side, or until it flakes easily with a fork. While that’s happening, cut some stuff! Cut the avocado and mango into big chunks, and mix them with a dash of salt and the juice of one lime. Now you have a nifty burrito / fish taco / lettuce wrap / fitnessing buffet. BUT WAIT THERE’S MORE. At the last minute I remembered that some people like a creamy chipotle sauce? So I made a “not-that-at-all” version of 2 tablespoons of greek yogurt and a half teaspoon each of garlic powder, chili powder, and cumin. It added a really nice spice and creaminess to the fish wrappurito. If you know how to use other spices and make it better, go for it. But this is what I had, and maxed out my capacity for invention. 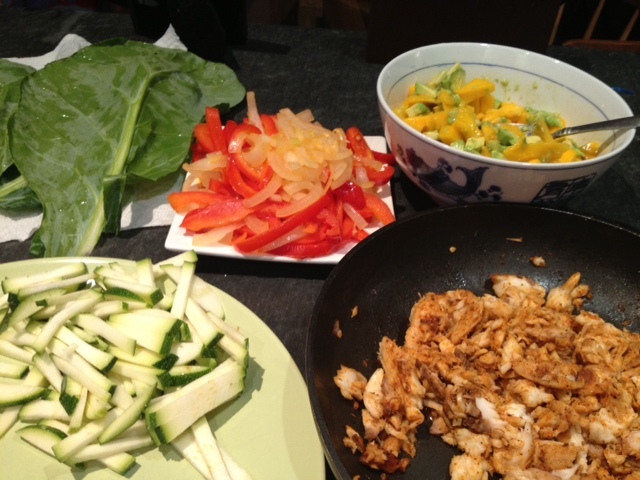 Now you can assemble the wrap thing, by first applying the special sauce, and then everything else in whatever order you want, although if you’d like to do it in the most logical order, you would do special sauce, onions and peppers, fish, crunchy veggie, mango / avocado mix. 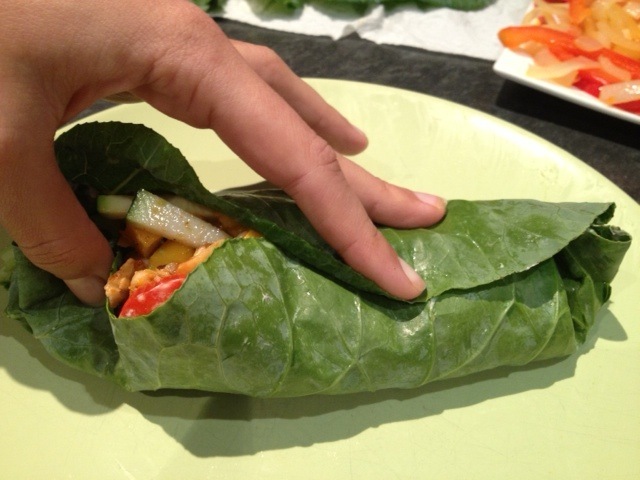 So, to roll it into a burrito like form, this handy site has the tip of trimming the thick stem of the collard green (by cutting it sort of sideways, without cutting the leaf, it’s hard to explain, go to the link and check it out). All the other advice this nice girl’s blog gives didn’t work, like the whole “put everything on one side of the green and then roll it and you can cut it and it stays!” thing. Mine was a “once you pick this up you cannot put it down until you’re finished or it will fall apart” thing. BUT, very tasty. Also, if you put everything in the middle, your flavors will be more even, as opposed to “that bite was mango and the next bite was fish.” Go for the even flavors, put all that stuff in the center. Anyway, if you have a secret to making wraps stay wrapped, please let me know. It would be nice to take a break when I’m eating these. 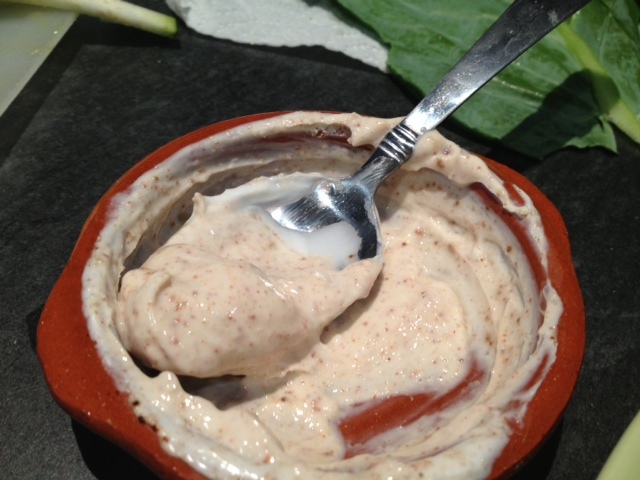 Also, I’m all ears for a better “greek yogurt and stuff in my cabinet” sauce for this. 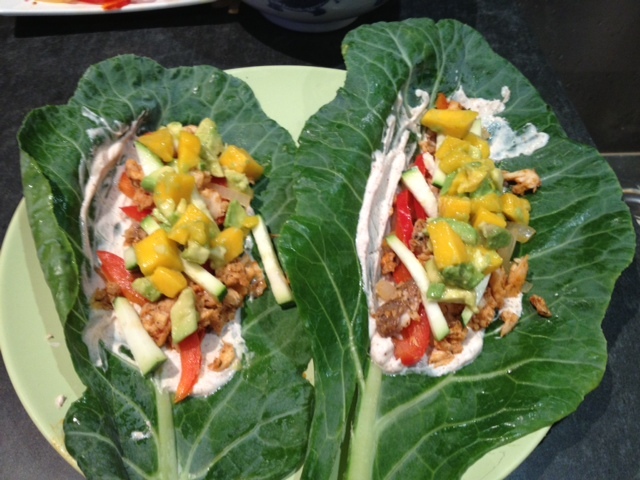 Do 2 wraps per serving, this makes 8 wraps. Leftovers! Also, did you notice there is no starch here? We’re just working with lean protein, veggies, and fruit, plus a dollop of greek yogurt. This is a healthstravaganzaa. This is the stuff that dream dinners are made of. “A Taste of Thai” Garlic Hot Sauce + Greek Yogurt = awesome creamy goodness (great for spreading on chicken burgers, or any taco-like dish). That’s not in my cabinet, but from the sound of it, it will be soon…. thanks gurl! Pingback: Okay But Desserts | Britt Does Fit.